FULL TIMEThe Tigers have come out and torn the Magpies apart in the final term as they run out 48 point winners. BEHIND TIGERSDeledio with a snap at goal but it is off target and through for a minor score. BEHIND MAGPIESCloke gathers the spill of the ball as he takes a shot on goal but can only manage a point. BEHIND MAGPIESMooney with a quick shot on goal but he is offline. GOAL TIGERSDeledio decides that he wants his share as he kicks his second goal for the day. Richmond lead by 49 points. GOAL TIGERSCotchin comes out to take the mark 30m from goal directly in front. He kicks his fourth goal of the match. 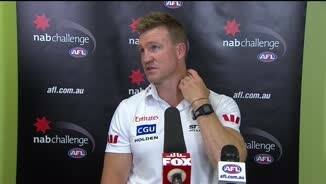 It will be back to the drawing board for Nathan Buckley and his Magpies team, as they look to find the winning formula. 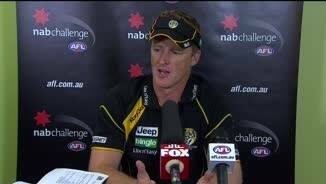 The Tigers fans will have their faith in their team restored after a disastrous result last week. SUPER GOAL MAGPIESWhite with a long bomb from outside 50 and he kicks a super goal. That was unexpected as was almost from a standing start. It will be interesting to see how the Pies will fit the ruck/forward division this year, with Grundy, White and Lynch all contenders for regular positions. The sting has gone out of this game, with the result a forgone conclusion. Both these teams have one more practice game left each, as they prepare for the upcoming 2014 season. 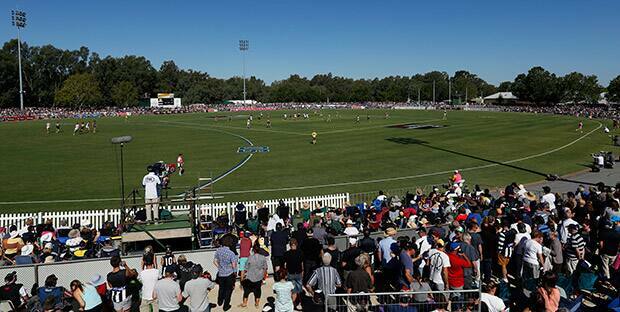 The Pies have given up here, as the Tigers have run riot in the final term. GOAL TIGERSVickery marks 47m from goal on a slight angle. He kicks it well as he gets high fives all around. The Tigers lead by 46 points. GOAL TIGERSHouli with a handball over to McDonough, who snaps from 45m and it clears the pack for a goal. Richmond are home! Hampson with the clearing hit out as the Tigers look to kick the sealer. They lead by 34 points at the moment and another goal would just make this one a certainty. BEHIND MAGPIESBall attempts a shot at goal to bring the Pies back into the game but all he could manage was a point. GOAL TIGERSCotchin comes out and takes the chest mark 30m from goal directly in front. He kicks his third goal of the day as he extend the Tigers lead to 35 points. Houli with a strong mark in front of Kennedy, across half back. The Tigers load up as they look into attack. Young has a free kick after a suspect 50m penalty given from the umpire. He goes for the nine pointer and he misses the lot. GOAL TIGERSAaron Edwards delivers the ball to Vickery, as he takes the mark. He kicks truly and all of a sudden it is a 29 point margin. The Tigers are looking all the goods at the moment, they have come out of the final break well. GOAL TIGERSThe ball gives Frost a cruel bounce as Aaron Edwards grabs it and kicks a goal. The final term is under way as the Tigers get first possession of the ball. THREE QUARTER TIMEAs well as Collingwood played in the third term, they were only able to cut the Tigers half time lead by four points. Richmond lead Collingwood by 17 points at the final break. This game has lifted into another gear, as we are set for an entertaining finish in the last quarter. BEHIND MAGPIESElliott with a shot at goal and Houli is happy to see it through as it goes through for a point. The Pies need the next goal to go into the last break within two goals of the Tigers. A great tap in the goal square from Morris, allows the Tigers to clear it away from the danger one, without conceding any score. GOAL TIGERSVickery takes a juggling mark 20m from goal directly in front. He comes in and kicks it straight through the middle. The Tigers are back out to an 18 point lead. BEHIND MAGPIESSidebottom takes the free kick on the boundary, for a deliberate out of bounds from the Tigers. He goes for goal but can only manage a point. GOAL TIGERSHouli fumbles it 15m from goal but has enough time to recover, as he runs to the square and boots it through. White over to Cloke, who marks 40m from goal directly in front. He shanks the kick at goal as it goes away to the right and is called on the full. BEHIND TIGERSArnot with a shot at goal from outside 50, but it is offline and through for a point. Richmond must kick the next goal, just to give them some breathing space as the Pies have been piling on the pressure. BEHIND TIGERSVickery is held onto by Frost as the umpire gives the free kick. He takes the kick from 50m out but it drifts away at the final moment. GOAL MAGPIESCloke leads and takes the chest mark 30m from goal. His kicks is fantastic as he threads it through for his third goal of the game. The Pies are back to within five points. BEHIND TIGERSHampson grabs the ball on the goal line, attempts to put boot to ball but misses as it goes through for a point. GOAL MAGPIESReid uses his body well in the marking contest and takes the grab, 15m from goal directly in front. He kicks his fifth goal of the day. The Tigers are struggling across the middle of the ground as the Pies are starting to get on top of this contest. GOAL MAGPIESElliot with the short pass over to Kennedy, who spots Mooney all by himself in the goal square, he goes to him and Mooney kicks an easy goal for the Pies. The Pies are like clockwork, as with a string of handballs they clear the ball away from defence. The first goal of the second half will be very important, in terms of momentum. The Tigers defence are under a world of pressure as they clear it away from the last line of defence. BEHIND TIGERSDeledio takes it inside 50, has a shot at goal and it is away to the left for a point. The umpire slams it in the middle of the ground and we are under way for the third term. HALF TIMEThe Tigers go into the main break holding a 21 point lead over the Magpies. The Tigers are keeping the Magpies at bay, looking very happy with the lead that they have established. The Magpies could do with a goal before half time, just to get the margin to below 20 points. Fatigue is starting to set in for both teams, with the sun starting to have an effect. GOAL TIGERSA marking contest between Edwards and Griffiths, has Lloyd as the lucky recipient of the spill of the ball as he runs to the goal square and kicks the goal. The Tigers are now pushing forward now, as they look to restore the status quo. GOAL MAGPIESCloke drops the mark, he gathers his own crumbs as he kicks around the corner for a much needed Collingwood goal. It is a battle between the midfields at the moment, with the game firmly in the balance. Richmond have got enough time left on the clock, if they want to post a five goal plus margin before half time. GOAL TIGERSCotchin comes out and takes a strong overhead mark, 10m from goal, directly in front. He drills it as the Tigers open up a 21 point lead. Grundy is starting to show a bit of anger on the ground, as he takes Thomas a little high, giving away a 50m penalty. BEHIND MAGPIESWhite takes a strong mark 35m from goal on a slight angle, he tries to swing it around and misses away to the right. BEHIND TIGERSThe ball is pushed over the goal line and through for a Tigers rushed behind it goes. BEHIND TIGERSGriffiths with a shot on goal but it bounces the wrong side of the goal posts and through for a point. BEHIND MAGPIESKennedy with a bouncing shot at goal, but it rolls to the left of the goal. Richmond would be quiet pleased that they have been able to drag the margin back out a bit, as the Pies were coming at them. SUPER GOAL TIGERSArnot with a huge kick from the centre square and it bounces through for a super goal. What a great kick. GOAL MAGPIESReid comes out and takes the mark 35m directly in front. There is his fourth goal of the match. Whatever Buckley said to his troops at the quarter time break, it has certainly worked. GOAL MAGPIESReid kicks from 20m in front and he kicks his third goal of the day. The Pies are back to within 12 points. Young kicks to a leading Reid, who gets front position to take the mark. GOAL MAGPIESCloke comes out and takes the mark 30m out from goal and finally, he breaks the string of Richmond goals, by kicking his first goal of the game. GOAL TIGERSGriffiths has his arms chopped in the marking contest by Keeffe and is awarded a free kick 25m from goal, directly in front. He kicks a goal for the Tiges! We are back for the second term, as the Tigers take the ball away from the middle. QUARTER TIMEA great term for the Tigers as the go into the first break, holding an 18 point lead over the Pies. The Tigers have dominated this first term and do not look like that they are willing to give the Pies a chance to score at all. BEHIND TIGERSThe ball comes off hands and as Aaron Edwards attempts to reach it before the goal line, it goes through for a rushed behind. All credit to the Tigers who have come out seathing today, as they look to upset the Pies. BEHIND TIGERSDeledio takes possession inside 50, has a shot at goal, but this time he is inaccurate. The Pies forwards have been largely unsighted in this term, after White set the pace for them last week. Collingwood would love a goal just before the first break, just to give them a bit of confidence. BEHIND TIGERSEllis with a quick shot on goal, but he is offline and can only manage a point. The Tigers fans would be relieved to see this sort of start from their boys, after last week's disappointing loss to the Demons. GOAL TIGERSCotchin roves the ball, looks up at goal and kicks it straight through the middle. The Tigers keep the Pies at arm's length. GOAL MAGPIESReid comes out and takes another strong mark. He lines up for goal and kicks truly. The Pies are back within nine points. BEHIND TIGERSAaron Edwards marks 45m from goal, he takes the set shot and he pulls it away to the right for a point. GOAL TIGERSHampson with a handball over the top to Lloyd, who kicks a great running goal. The Tigers are looking the goods here. GOAL MAGPIESMooney puts on the after burners, runs to 15m from goals and kicks a much needed goal for the Pies. GOAL TIGERSShane Edwards is on the burst from the wing, he takes it to 40m from goal and kicks it to the top of the square, as Vickery takes the mark. He kicks an easy goal. The Pies are missing some of their big guns, such as Beams, but have a lot of their familiar faces lining up today. GOAL TIGERSDeledio gathers possession inside 50, has a quick shot at goal and it bounces through. Richmond lead by eight points. The worrying sign for the Pies, is that they are not able to get the ball past the centre at the moment. BEHIND TIGERSPetterd is awarded a free kick after a bit of a push and shove from both teams. Petterd kicks it across the face of goal. The Tigers are getting on top of this contest after a good start by the Pies. GOAL TIGERSYagmoor turns it over as his handball goes straight to the hands of Ellis, who offloads it to Edwards who kicks a running goal. BEHIND TIGERSGriffiths comes out on a lead and takes the mark 35m from goal on a 45 degree angle. He kicks it across the face of goal for a point. GOAL MAGPIESReid comes out and takes a strong mark 30m from goal directly in front. He kicks it straight through the middle. Welcome to an overcast Norm Minns Oval at Wangaratta for the clash between two AFL heavyweights, Collingwood and Richmond. SIZZLING performances from Richmond's 'big three' midfielders has inspired the Tigers to a 48-point drubbing of Collingwood in the NAB Challenge clash in Wangaratta. Trent Cotchin, Brett Deledio and Dustin Martin all had 30-plus possessions with Cotchin booting four goals and Deledio slotting two. If Richmond coach Damien Hardwick's new game plan is to see more goals from his midfielders, he certainly would have been pleased. Cotchin managed just six goals for the entire 2013 season. 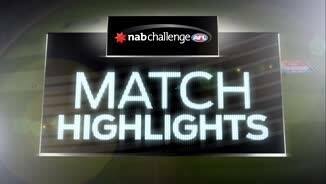 After losing to Melbourne in their NAB Challenge opener, the Tigers were very impressive against the Pies, kicking seven final-quarter goals after the Pies got within five points in the third quarter. They won 1.17.13 (124) to 1.10.7 (76). Reece Conca was also outstanding in his first game back from the hamstring tendon tear he sustained in the Tigers' finals loss to Carlton last year. He only played the first half but racked up 16 touches and won five clearances. Brandon Ellis played well on the wing and across half-forward while Martin collected his 32 disposals across half back and spent time on Scott Pendlebury in the second quarter. 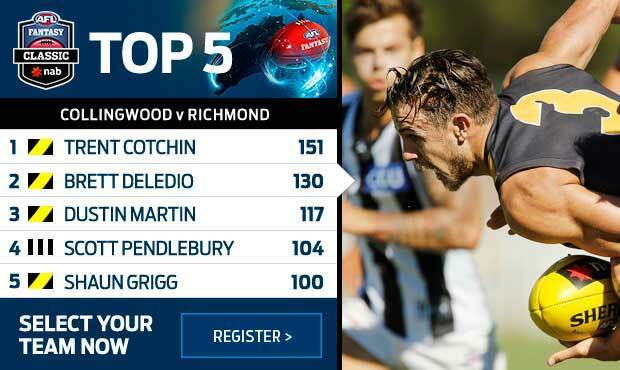 In the final term the Richmond skipper, Cotchin, dominated as Collingwood's defence crumbled. But it was far from doom and gloom for Pies coach Nathan Buckley. His plan to play Ben Reid alongside Travis Cloke in his forward line this season also paid dividends with the two combining for eight goals. It was Reid's first competitive hit-out for the year after the Pies took a conservative approach to his pre-season following a calf injury. The Wangaratta native drew a variety of opponents with Jake Batchelor spending the most time on him in the first half and Troy Chaplin after the break. But nothing could stop the 2010 premiership defender as he marked strongly, moved well and had no trouble finding the goals. Cloke also looked fit as he kicked three goals despite the hard work of David Astbury. Concerning for the Tigers was a lower leg injury sustained by Batchelor in the dying stages of the second quarter. He was helped from the ground as the teams left the field for the main break and struggled to put weight on his left leg. He didn't return after the half-time break with the injury later revealed to be a corked calf. Ricky Petterd and Jake King played minimal minutes in their first hit-outs for the year – Petterd collecting 10 touches through the midfield before the main break and King coming on for the third quarter. The small forward, whose off-season has been coloured by his infamous relationship with biker Toby Mitchell, started slowly but had a few flashy moments, setting up Tyrone Vickery for one of his four goals in the third. For the Magpies, Dane Swan and Pendlebury found plenty of the ball; Swan looking slim in his first game for the year as he racked up 26 possessions. Alex Fasolo, also in his first game for 2014 after the foot injury that wrecked last season, played across half back and was solid. Brodie Grundy rucked with the help of Quinten Lynch after the late omission of Ben Hudson and caught the eye twice in the first half for giving away 50m penalties after run-ins with Matt Thomas. Collingwood: A fit Clinton Young is a solid acquisition for the Magpies' midfield. The ex-Hawk, whose first season in the black and white was ruined by calf and hamstring problems, impressed with some bursts out of the middle and delivery with his accurate left foot – one of which hit Ben Reid on the chest directly in front of goal. While Reid clearly looks good in attack, questions remain over whether his presence up forward robs Collingwood's backline of experience with Lachie Keeffe, Jack Frost and Nathan Brown left to curtail the big forwards in his, and Nick Maxwell's, absence. Richmond: The Tigers regrouped after last Friday night's surprise loss to Melbourne and showed they can be competitive despite the absence of key players Jack Riewoldt, Ivan Maric, Chris Newman and Daniel Jackson. Their midfield depth has also increased with targeted recruiting – Matt Thomas and Anthony Miles have shown they can win the ball and will easily slot in when called upon, while mature-age former VFL forward Sam Lloyd brings something new to their attacking structure. Collingwood: The Pies had no new faces but got another game into recruits Tony Armstrong, Jesse White and Jonathon Marsh. Armstrong wasn't prolific but White took six marks and took the ball inside 50 four times. Marsh started as the substitute and showed a bit in the minutes he got after half time including an impressive run down tackle in the middle of the ground. Richmond: Former Port Adelaide midfielder Matt Thomas was the Tigers' only new face after the omission of Nathan Gordon from the extended squad. He gathered plenty of the ball when he wasn't antagonising Brodie Grundy and worked hard in the middle, proving he'll give the midfield depth if injuries strike. Sam Lloyd, who played in the Tigers' first game against Melbourne for nine disposals and five marks, nailed a long goal in the first quarter and ended the game with two. Former Giant Anthony Miles, who is vying for a senior list upgrade before the start of the season, began as substitute in the first half and finished with 18 touches after coming on in the third quarter.